Here's something different! 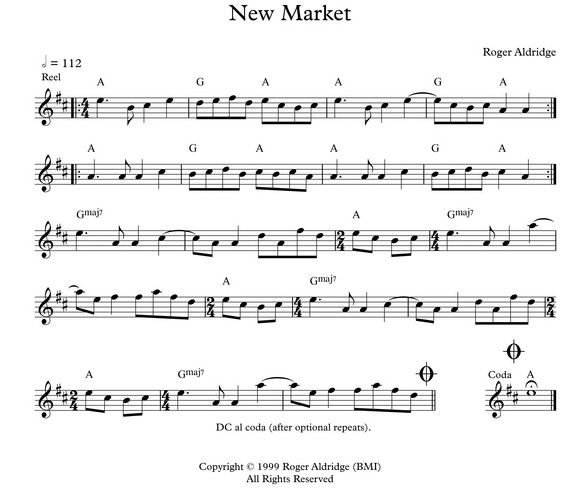 New Market is a fiddle tune with a mix of old-time and contemporary styles. The tune's form is also unusual: A (8 bars), B (8 bars), C (11 bars). Listen for the shifting time in the C part. While New Market was inspired by the town in Maryland, I also think of it whenever we are in New Market, Virginia. Recorded by Amy Leonard, violin; E. Shawn Qaissaunee, guitar; and Peter McCarthy, bass. This tune represents a vision that I have had since the early 1990's of old-time fiddle music being one of the roots of early jazz. In this vision I see jazz musicians going back to these pre-New Orleans roots and discovering the music. I had jazz players in mind when I wrote New Market; however, if it catches on with traditional fiddle players that would also make me happy.